The great Yuen Biao plays Hsia, a prosecutor who is tired of seeing the bad guys go free and the justice system constantly protecting villains and ignoring the victims of their crimes. Some seriously bad dudes are out there annihilating entire families to keep them quiet. So Hsia decides to go after the baddies in his off time, which works out well because this lawyer is also an incredibly skilled martial artist. Cynthia Rothrock plays Cindy, a CID agent who is constantly on Hsia’s tail. Their conflict is about the nature of justice and law in society. Her partner is Bad Egg, a slovenly cop played by the director, Corey Yuen. But will Hsia or Cindy triumph in the final battle with the super-evil bad guy (who I can’t reveal because it is too close to a spoiler)? Above the law is simply awesome. It delivers the goods to the audience in spades with slam-bang action right from the first minute. 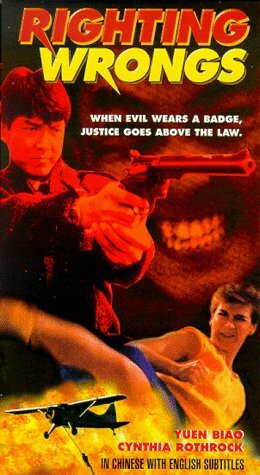 The pedigree of the film is impressive, with not just familiar names such as the amazing Yuen Biao and Cynthia Rothrock (who also delivers one of the better performances we’ve seen from her), but the producers got some American fighters to fly to Hong Kong such as Peter “Sugarfoot” Cunningham and Karen Sheperd, who have both gone on to good careers since. As you may know, Yuen Biao came from the same Opera School that produced Jackie Chan and Sammo Hung. His skills in fighting and stunts are at least equal to his classmates. But for some reason, outside of action circles, he never reached their level of fame. 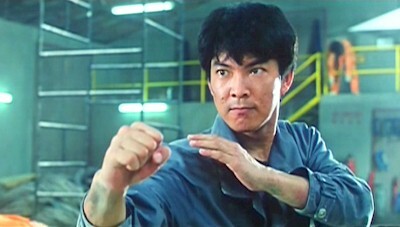 Notably, an uncredited Sammo choreographed the final fight. Siu-Wong Fan, who plays the character of Wen, a teenage witness, went on to play the title role in Story of Ricky. The reason Melvin Wong looks so muscular and pumped up here is because he trained under Bolo Yeung. 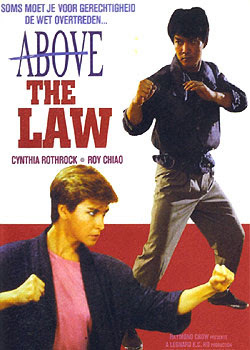 Above the Law features, on top of the ace fighting and stunt work, the same crowd-pleasing wacky comedy and lovable characters known in Hong Kong productions. (Interestingly, some scenes were shot in Auckland, New Zealand). Also featuring some killer music, the movie is just a blast, an incredibly fun rush of fast-paced action setpieces. 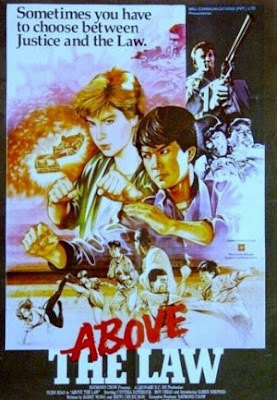 For an over-the-top 80’s HK action film, it’s hard to top the first-rate Above the Law. Check out a write-up from our buddies at 10k Bullets! I think you and DTVC have convinced me thoroughly on this one. I'll pick it up as soon as I can! Cool! Above The Law is a classic! This is one of my favorite kung-fu films of all time and the movie that got me into Cynthia and Biao. One of the best parts is the ending, so brutal. Yeah, absolutely fantastic. Well worth your investment. The Goodkind: Totally agree and Rothrock and Biao were at their absolute best. The ending was surprising and brutal! DTVC: The movie is definitely worth purchasing. We are happy to have it in our collection! great review. this is one of Yuen Biao's absolute best. Thanks Drive2! Above The Law is one of the best action movies ever! Cynthia Rothrock... Will you marry me? Oh, I'm already married. Still, she would be fun to have around as well. That would be great! Rothrock can definitely fight off any intruders!